In order to stack non-tracking subframes for widefield astrophotography, it is important to get images with no field curvature. My lens Canon EF-S 18-55mm when working at lowest zoom, that is 18mm of focal, presents a clear barrel distortion as reported in the image below. Nevertheless, it can be corrected applying a pincushion lens distortion of 15 in Paint Shop Pro. But the image border remains distorted so it is needed a crop reducing the image to an 80% of its original size. Of course, the best solution is to stop using the 18 mm focal length for shift-and-add astrophotography. Instead longer focal is advisable like 35 mm, where the lens does not show any significant distortion in the field of view. Another advice to get a sharp focus and pinpoint stars with Canon EF-S 18-55mm lens is to always use a focal ratio no less than F:5 and no more than F:10. 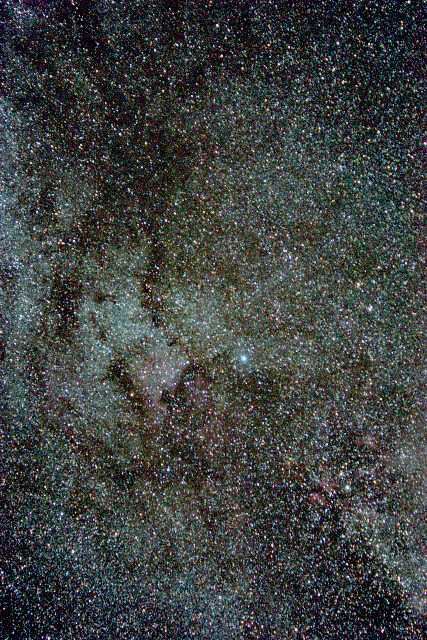 Under F:5 the lens coma aberration would mess the stars near the image border and over F:10 the diffraction would create big Airy patterns instead of pinpoint stars. I have said above that “it is important to get images with no field curvature to do shift-and-add astrophotography”. I must correct it. Sky pictures are not like an image of a wall. A wall is a plane surface, but the sky is not. Actually, the sky is an sphere, the celestial sphere, that is constantly rotating around Polaris. So, the correct way to add images is not converting them to plane field, but to spherical field in the right proportion. I have told you that pincushion lens distortion corrects the field. That is truth, but it is not appropriated to process non-tracking subframes. The subframes must firstly be corrected to show an spherical field. So the right filter to apply is indeed a barrel lens distortion, increasing this way the natural barrel that comes with the lens. It is easy to verify this, just trying to overlap 2 distant subframes. The first and the last of the session may be optimal. Only after applying a barrel of 17 in Paint Shop Pro I could overlap successfully the subframes, preserving angles and distances between stars.